An appearance in the NIT Season Tip-Off, games in the boroughs of Queens, Manhattan and Brooklyn, a showdown against Syracuse at the Carrier Dome and a tilt with Duke at “The World’s Most Famous Arena” highlight the 2014-15 St. John’s men’s basketball schedule, which was unveiled today in conjunction with the release of the BIG EAST schedule of games. The Red Storm will play a total of 16 regular season games against teams that participated in the 2013-14 postseason, including 10 games against NCAA Tournament foes Creighton, Duke, Providence, Syracuse, Villanova and Xavier. Following the annual Red Storm Tip-Off event on Friday, Oct. 17, St. John’s will take the court for a pair of preseason exhibition contests at Carnesecca Arena against NCAA Division II competition. The Red Storm will welcome a familiar foe on Saturday, Nov. 1, for its first preseason game as Humboldt State makes a trip to Queens for the second-straight season. The exhibition calendar concludes on Saturday, Nov. 8, with a visit from St. Thomas Aquinas. The 2014-15 season officially tips off on Friday, Nov. 14, as the Red Storm welcomes NJIT to Carnesecca Arena. Including a 57-49 triumph in the most-recent meeting on Dec. 1, 2012, St. John’s is 3-0 all-time against the Highlanders in a series that dates back to 2006. Four games as part of the NIT Season Tip-Off are next on the schedule. As part of its sixth appearance in the event, St. John’s will play two games at Carnesecca Arena and two games at Madison Square Garden. The Red Storm last appeared in the event in 2008 and has posted an 11-6 record all-time. St. John’s opens play in the NIT Season Tip-Off with the two on-campus contests as Franklin Pierce visits on Monday Nov. 17, before LIU Brooklyn comes to Queens for a matchup on Wednesday, Nov. 19. The Red Storm then heads to MSG to play Minnesota, winners of the 2014 Postseason NIT, on Wednesday Nov. 26. The NIT Season Tip-Off concludes at The Garden against either Georgia or Gonzaga on Friday, Nov. 28. A visit to Queens from Niagara on Tuesday, Dec. 2, represents the 99th meeting against the Purple Eagles in a series that traces its roots back to 1909. St. John’s is 71-27 against its fellow Catholic, Vincentian University. St. John’s extends a century-old rivalry and completes a home-and-home series against Syracuse with a visit to the Carrier Dome on Saturday, Dec. 6. The teams, which have met 88 times dating back to 1912, met at The Garden on Dec. 15 last season with the then-No. 2/3 Orange prevailing, 68-63. A 49th appearance in the Madison Square Garden Holiday Festival is next on the schedule as St. John’s takes on local foe Fordham on Sunday, Dec. 14, as part of the one-day doubleheader event. The Red Storm and Rams have met in the MSG Holiday Festival in each of the past three seasons since the annual event transitioned to its current one-day format. Consecutive-games against California foes follow as Saint Mary’s visits Queens on Friday, Dec. 19, before Long Beach State comes to Carnesecca Arena on Monday, Dec. 22. Though the series dates back to 1967, the Red Storm and Gaels have met just twice previously with St. John’s notching a 67-50 win in the first-ever meeting at then-Alumni Hall. In a game that marked the beginning of The Lavin Era, the Red Storm was edged by Saint Mary’s, 76-71, on the road in Moraga, California, on Nov. 16, 2010 as part of ESPN’s third annual College Hoops Tip-Off Marathon. St. John’s and Long Beach State have not previously met on the hardwood. St. John’s returns to Brooklyn, where the University was founded in 1870, and visits Barclays Center for a matchup with Tulane on Sunday, Dec. 28, as part of the BROOKLYN HOOPS Winter Festival presented by Honda. The conference schedule gets underway once again this season with a five-game New Year’s Eve marathon. St. John’s and Seton Hall will open the marathon with a noon tip-off on Wednesday, Dec. 31, at the Prudential Center. Back-to-back home games are next on the schedule as St. John’s welcomes Butler to Carnesecca Arena on Saturday, Jan. 3, before hosting Villanova at Madison Square Garden on Tuesday, Jan. 6. The Wildcats are the most-frequently played opponent in program-history as St. John’s holds a 60-49 advantage in a series that dates back to 1909. After a trip to the Dunkin’ Donuts Center to face Providence on Wednesday, Jan. 14, St. John’s heads to Rosemont for a matchup with DePaul on Sunday, Jan. 18, before returning home to host Marquette at Madison Square Garden on Wednesday, Jan. 21. Following a two-season hiatus that was preceded by 14-straight seasons with a meeting on the hardwood, St. John’s rekindles its rivalry with Duke at “The World’s Most Famous Arena” on Sunday, Jan. 25. The teams last met on Jan. 28, 2012, when then-No. 8/6 Duke notched an 83-76 victory at Cameron Indoor Stadium, where St. John’s remains the last non-conference team to defeat Duke on its home floor (Feb. 26, 2000). In the most-recent meeting at MSG on January 30, 2011, St. John’s cruised to a 93-78 victory over the then-No. 3/3 Blue Devils in front of a sellout Garden crowd as well as a national television audience on CBS. St. John’s then heads west and travels to Omaha to face Creighton on Wednesday, Jan. 28, before finishing its season series against Providence on Saturday, Jan. 31, at Madison Square Garden. The Red Storm next visits Hinkle Fieldhouse on Tuesday, Feb. 3, to take on Butler and then returns to MSG on Saturday, Feb. 7, to face Creighton for the second time in less than two weeks. St. John’s closes out its home-and-home with DePaul on Wednesday, Feb. 11, at Carnesecca Arena. A road trip with a quick turnaround follows as St. John’s travels to Xavier on Saturday, Feb. 14, before heading to our Nation’s Capital for a matchup with Georgetown on Tuesday, Feb. 17, at the Verizon Center. A three-game homestand closes out the home portion of the regular season schedule. After hosting Seton Hall at Carnesecca Arena on Saturday, Feb. 21, St. John’s welcomes Xavier to MSG on Monday, Feb. 23, and then plays Georgetown on Saturday, Feb. 28, at The Garden. After heading to Milwaukee to play Marquette on Wednesday, March 4, St. John’s concludes the regular season against Villanova on Saturday, March 7, at the Wells Fargo Center in Philadelphia. The 2015 BIG EAST Tournament Presented by New York Life, played at Madison Square Garden for the 33rd consecutive season, will be held from March 11-14. FOX Sports 1 will carry each game of the 2015 BIG EAST Tournament. St. John’s made its second-straight NIT appearance last season and finished with a 20-13 record, while earning a share of third place in the BIG EAST standings with a 10-8 conference mark. The Red Storm has earned postseason berths in three of the past four seasons, including two NIT trips and one NCAA Tournament appearance. Season tickets are available now and start at just $295 for a full-season package. 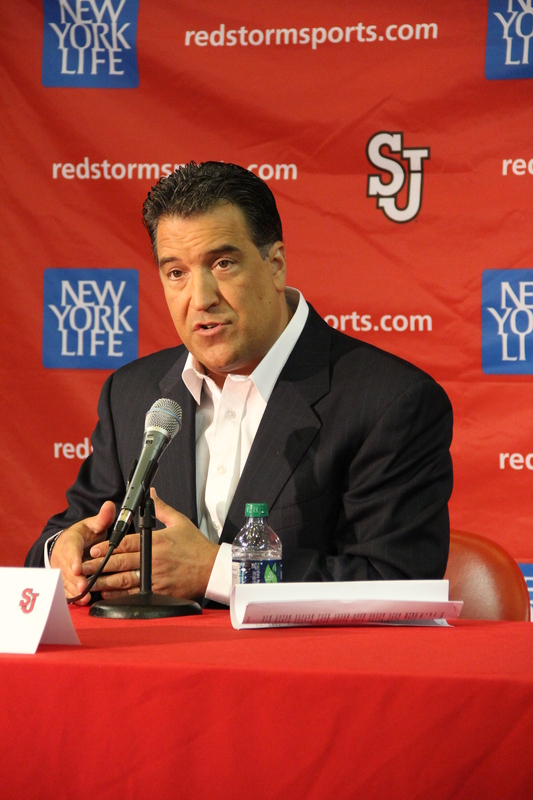 For more information, call 718-990-2142, visit RedStormTix.com or stop by the Carnesecca Arena Ticket Office. St. John’s season ticket members can reserve the best seats available at both home venues and enjoy significant savings on a per game basis. Other benefits include priority on purchasing additional tickets to premium and postseason games before the general public, an exclusive season ticket member gift and guaranteed access to tickets to the 2015 BIG EAST Tournament at Madison Square Garden. To contact the Carnesecca Arena Ticket Office directly, call 1-888-GO-STORM. 11/14/14 ~ NJIT ~Queens, NY (Carnesecca Arena) ~ 7 p.m.
11/17/14 ~ Franklin Pierce ~ Queens, NY (Carnesecca Arena) ~ 7:30 p.m.
11/19/14 ~ LIU Brooklyn ~ Queens, NY (Carnesecca Arena) ~ 7:30 p.m.
11/26/14 ~ Minnesota ~ New York, NY (Madison Square Garden) ~ 7 p.m.
11/28/14 ~ Georgia/Gonzaga ~ New York, NY (Madison Square Garden) ~ 4:30/7 p.m.
12/2/14 ~ Niagara ~ Queens, NY (Carnesecca Arena) ~ 7 p.m.
12/6/14 ~ at Syracuse ~ Syracuse, NY (Carrier Dome) ~ 5:15 p.m.
12/10/14 ~ Fairleigh Dickinson ~ Queens, NY (Carnesecca Arena) ~ 8:00 p.m.
12/14/14 ~ Fordham ~ New York, NY (Madison Square Garden) ~ 1:30 p.m.
12/19/14 ~ Saint Mary’s ~ Queens, NY (Carnesecca Arena) ~ 7:00 p.m.
12/22/14 ~ Long Beach State ~ Queens, NY (Carnesecca Arena)~ 7:30 p.m.
1/3/15 ~ *Butler ~ Queens, N.Y. (Carnesecca Arena)~ 4/6 p.m.
1/6/15 ~ *Villanova ~ New York, NY (Madison Square Garden) ~ 9:00 p.m.
1/14/15 ~ *at Providence ~ Providence, RI (Dunkin’ Donuts Center)~ 7:00 p.m.
1/18/15 ~ *at DePaul~Rosemont, Ill. (Allstate Arena)~ 2:30 p.m.
1/21/15 ~ *Marquette~ New York, NY (Madison Square Garden) ~ 7:00 p.m.
1/25/15~ Duke ~ New York, NY (Madison Square Garden) ~ 2:00 p.m.
1/28/15 ~ *at Creighton ~ Omaha, Neb. (CenturyLink Center Omaha) ~ 9:00 p.m.
2/3/15 ~ *at Butler~ Indianapolis, Ind. (Hinkle Fieldhouse)~ 7 p.m.
2/11/15 ~ * DePaul ~ Queens, NY (Carnesecca Arena)~ 9:00 p.m.
2/14/15 ~ *at Xavier~ Cincinnati, Ohio (Cintas Center)~ 3:00 p.m.
2/17/15 ~ *at Georgetown~ Washington, D.C. (Verizon Center)~ 7 p.m.
2/21/15 ~ *Seton Hall ~ Queens, NY (Carnesecca Arena)~ 2:30 p.m.
2/23/15 ~*Xavier ~ New York, NY (Madison Square Garden)~ 8:00 p.m.
3/4/15 ~ *at Marquette ~ Milwaukee, Wis. (Bradley Center) ~ 9:00 p.m.